RAM mounts are, no doubt an important part of boating and (by extension) fishing. However, in order to get the most from your mount, it’s important to ensure you invest in a rugged one. Basically, a rugged mount is one that comes with a comprehensive list of mounting systems. 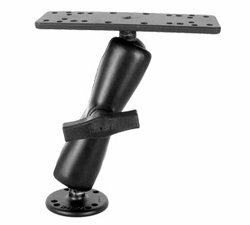 And since choosing the best RAM mounts marine is not always an easy task, we have made the task easier for you. Here’s a run-down of the 5 top choices you’ll find. Comparison tables are an excellent way to get an inside scoop without having to read the detailed reviews. Here’s one such handy table for you. National-Products Ram is a medium priced mounting device manufactured by National Products. The parts and components are made from various materials including Aluminum, rubber, durable composites, steel, and stainless steel. It has a unique design with two pivot points, that is, the base and bracket. The bracket comes pre-drilled and can mount a variety of devices. You can use it to secure your fishing equipment including Marine GPS, Ham Radios, CB Radios, Fish Finder among other electronic equipment. Installing it on a boat is easy. Removing it from the boat is equally easy because you just unscrew the base. The design of two pivot points also makes it easy to position your electronic device. 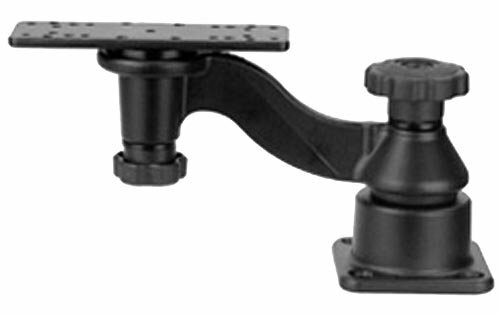 Ram Heavy Duty mount is manufactured by RAM MOUNTS. It is made from marine grade aluminum and has a powder coated finish and rubber balls. You can mount almost anything on it, and use it anywhere, thanks to its patented universal rubber ball and socket system. In addition, the Ram is heavy-duty and, therefore, sturdy with enough holes drilled in it. 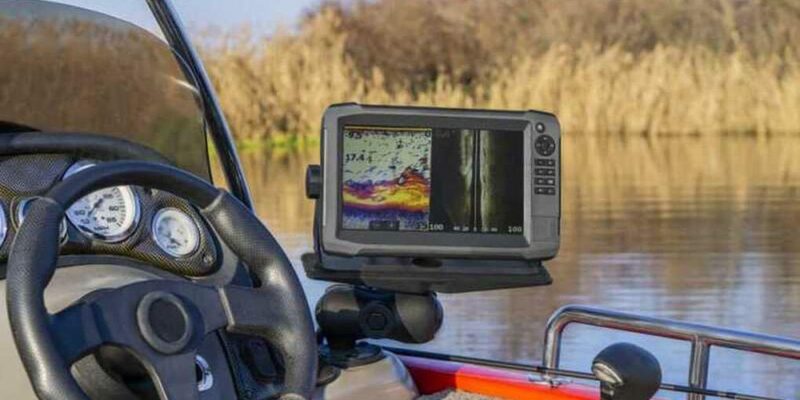 You can use it to mount your Fish Finder, GPS, Ham Radios, CB Radios among other fishing gear. It will keep your expensive equipment well secured on your boat. It has a superior vibrations and shock absorption system for electronics, therefore, protecting your equipment. Besides that, it is easy to install, move or adjust because of its unique design. However, the one disadvantage we found with this product is that it is quite expensive. That’s, probably because its parts are heavy-duty compared to what you’d find on other Rams. The brand is also manufactured from marine grade aluminum and not powder coated marine grade aluminum like other brands. Manufactured from Marine grade aluminum. 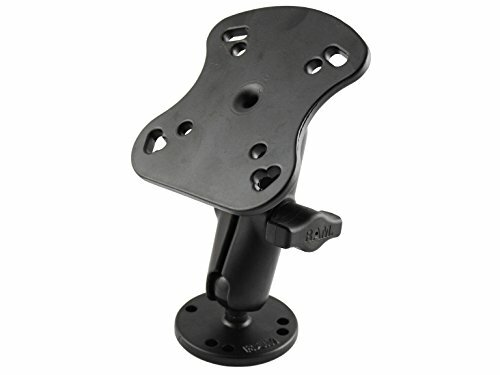 RAM MOUNTS Universal is a product of RAM MOUNTS. It is manufactured from powder coated marine grade aluminum. The device is designed with a double socket arm. One base is rectangular while the other base is circular with a 1.5" rubber ball. The circular base has a diameter of 2.5". The rectangular base is 6.25-inch by 2-inch. The device is ideal for mounting various electronics on your boat including Gimbal Brackets, Ham Radios, CB Radios, Marine GPS among others. The Ram’s rectangle base comes with various combinations of pre-drilled holes to match your mounting needs. Its ball-and-socket design is meant to dampen shocks and vibrations. This product comes at a medium range price, which may still be high if you are on a tight budget. RAM MOUNTS Long Arm Ram is a product of RAM MOUNTS. It is a basic Ram with a simple design. It is a long double socket mounting system that has two round bases with a diameter of 2.5". The round bases have the universal AMPS hole pattern. The device is 7.3125" long. In addition, it has a patented shock and vibration absorption system. Therefore, the device will not only secure your equipment, but the shock and vibration absorptions systems will help to extend the life of your device. Also, installing the ram is easy. Besides that, the device is reasonably priced. However, the device is not heavy duty like other brands in the market. It is not a heavy duty Ram. RAM MOUNTS Light Use is one of the brands by RAM MOUNTS. It is manufactured from powder coated marine grade aluminum. The Ram consists of the round base, double socket arm, and Humminbird/Apelco base. The round base is 2.5-inch in diameter and has a universal AMPS hole pattern. In addition, the Ram has the patented 1-inch rubber ball system and socket system. It is easy to install the Ram on your boat and also install your device on it. Using it keeps your electronics secure. However, the Ram is for mounting only small marine electronic devices. Its design allows various viewing angles and also adjustment options. It is not a heavy duty Ram, limited for mounting small marine electronic devices. First off, it’s important to go for a mount that can accommodate a wide variety of applications. That way, you’d be assured to find your mount to be quite practical in different situations. Besides that, always look at the kind of mounting base the mount has to offer. Ideally, you should go for one that’s optimized for tool-less installation and removal. Lastly, your mount should be durable. You can, therefore, always settle for something that’s made with heavy-duty components. If there’s one mount that seems to tick the right boxes, it’s the National-Products Ram RAM-109H Marine System 3002.9478. Besides being firm and heavy-duty, it’s also pretty rugged and, therefore, practical. The best adventures should always be preceded by good planning. Therefore, before you embark on that boating or fishing mission, be sure to have all the right gear in place. And that’s why we highly recommend carrying an affordable boat RAM mount with you at all times.